The biggest mistake most falconers make with a captive bred Harris's Hawk is to over-train it. Too much training ruins a bright and promising star. Most falconers treat the captive bred Harris's Hawk like a passage Red-tailed Hawk. No wonder this doesn't work, because the two are worlds apart! 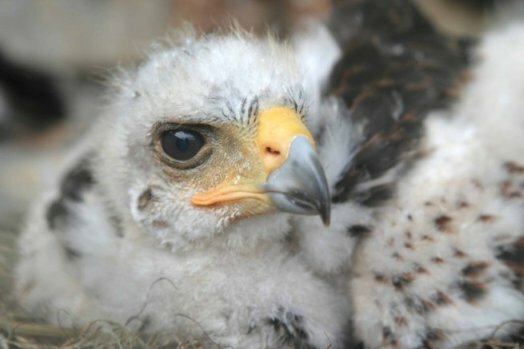 The captive bred Harris's Hawk grew up around and is perfectly comfortable with people. Its social lifestyle is probably why it is the most intelligent raptor known to falconry. Falconers need to observe their charges and adjust the training progress accordingly. Most captive bred Harris's Hawks do not require anywhere near as much repetition in training as a passage Red-tailed Hawk. DO NOT allow a captive bred Harris's Hawk to get low in weight. This can bring on screaming and mantling, and it is one cause of a fist-bound hawk. For some hawks,it alters the way they look at you and the world, with the focus being too inward and too much on the falconer. Let the hawk's behavior dictate how much weight reduction is needed--which often isn't much. NEVER feed a captive bred Harris's Hawk a meal on the glove. The only type of feeding that you should do from the glove is the occasional tidbitting. If you do this too much though, you are likely to create a fist-bound hawk.